With another anniversary series currently airing, it seems appropriate we take another look back over the years, but this time we look at the Drivers, how they’ve progressed in terms of technology and gimmick, and if they still hold as much charm today as they did back then. Next up we have the Wizard Driver. Well, we have the White Wizard Driver, as the Wizard Driver was unavailable for this review. The bright side is, the mechanics of the Driver are the same, however the White Wizard Driver features an alternate voice, phrasing and updated sound chips. But they’re essentially the same. Featuring a sleek black exterior, with silver paneling and red highlighting, the Driver really stands out from the crowd with style. One of the highlights of this Driver, is that you essentially have to shake hands with it to perform any functions. With your left hand, you Henshin, and your right, attacks. As to be expected, there is a mechanical component to work with, and that is a switch that changes the center piece from a left to a right hand, and indicates which hand should be placed in front of it. After selecting the side you wish to use, a jingle will play, for Henshins you will here, “Shabadoobi Touch Henshin!”, and for attacks “Lupachi Magic Touch Go!”. 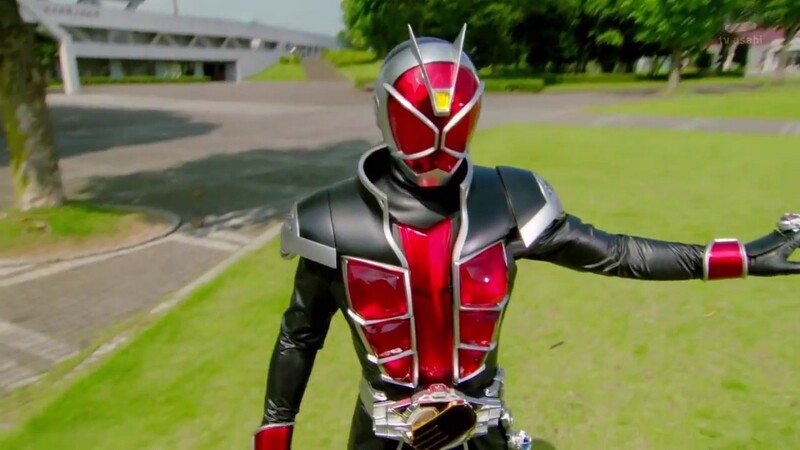 However if you scan an attack ring when the Driver is set to Henshin, you’ll hear the Driver say “Wrong Side”. The Ring designs are relatively simple, silver mount with a cut out pattern on the face, and a two prong ring section to wear it. There are special Rings with different colouring however, these featured later in the show and often featured Gold mountings. The centre of the Rings feature a Magic Stone, for the most part these were a translucent orange, but the assorted gashapon and candy toy versions were painted. While the mechanics are the same as the Wizard Driver, the White Wizard Driver features an alternate voice and sound set when scanning Rings, for example, when scanning the Wizard Flame Ring, the Driver will instead call out Volcano. To go along with the customary loud voice when scanning Rings, you get a flashing light in the centre of the hand. There doesn’t seem to be any pattern to the flashing, meaning it doesn’t correspond to the Ring scanned, but it does dim during quieter moments in the associated jingle. The Rings have a copper coil connected to a chip board with a low-power NFC chip and an LED connected to the receiver. Clever system, the Driver generates a static field when searching for the Rings. So it triggers the low power chip to turn on the LED..
It’s worth mentioning here, that an issue with the Wizard Driver was corrected for the White Wizard release, that being a “bleeding effect” from the light. On the original the light wasn’t in a solid circle, it would pass through the paint giving it a halo effect. As an added bonus, I present… Beast! With a simple aesthetic, and pin system operation, the Beast Driver doesn’t look like much. Featuring a black frame with silver “doors”, these open to reveal a gold chrome effect Lions face with a light in the forehead. On either side of the door is a switch, the right side is used for Form Rings, the left the Henshin and Hyper Rings. To use, simply insert the Ring, face down, the pegs do the rest. When the Henshin Ring is inserted, and the button inside is pressed, a standby jingle will play. If it runs long enough, the Beast will complain, but after a second or three, turn the Ring to complete the Henshin, and open the doors. With the Form Rings, it’s a little different, all you need to do with those is press them in so the buttons are pushed down, and the jingles will play. How this works, is that on the side of the Rings are a series of tabs, at first glance they just appear to be continuation of the Rings design but each one has a separate design. Regardless of which way around the Rings are inserted, the same jingle will play when inserted. Sadly, there is no scanner in the Beast Driver, this means that Wizard Rings will not trigger any additional sounds. But, the Beast Rings work just fine with the Wizard and White Wizard Driver. As with Wizard Rings, just pass them in front of the Driver and a jingle will play. While I do believe the Beast Driver suffers from lack of compatibility with additional Rings, it’s still quite a fun little thing to have and rounds off a Wizard collection quite nicely. Asthetically these have to be two of the best Drivers around, With colour selections that work beautifully together, and the door system of Beast being rather unique. The issue of compatibility aside, the scanning method is ingenius, though with the number of Rings available, it somewhat limited itself to what would actually trigger a voice line, there is only so much forward thinking that can go into something at the time of production after all. Still, more than welcome additions to any collection!